1. Fasten free gum categorically against tooth and strengthen attachment JE tooth. 2. The free gum with the rigidity needed to withstand the force of friction that results during chewing. 3. To combine free gum with cement root and alveolar bone. 4. Link adjacent teeth each other management tooth positioning in the dental arch. C. classification gingival fiber groups. 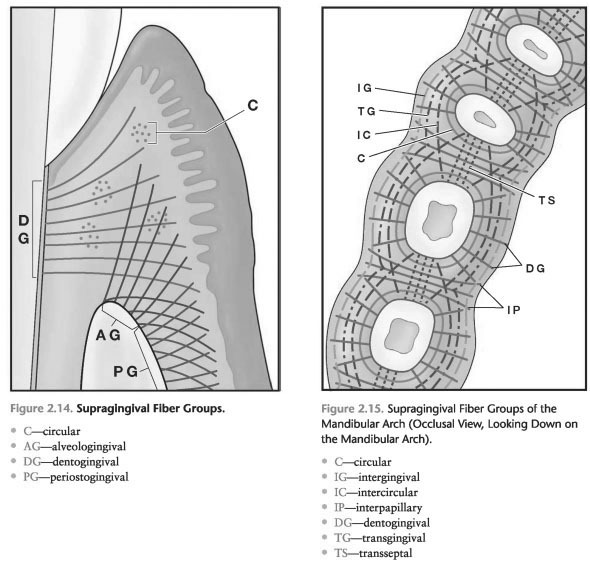 Supragingival fiber bundles are classified depending on their orientation, sites of insertion, and patterns that they connect (Fig. 2-14 and 2-15). 2. Circular fibers, covering the tooth in a ringlike way coronal to the alveolar ridge and is not tied to cement tooth (Fig. 2-14 and 2-15). These bundles of fibers connect adjacent teeth with each other. 3. Periodontal fibers embedded in cement, near the FAC and a fan in the connective tissue of the gums (Fig. 2-14 and 2-15). These fibers to act for the attachment of the gums to the teeth. 4. Periostogingival fiber-to expand laterally from the periosteum of the alveolar bone. These fibers of attachment of the gums to the bone (Fig. 2-14). 5. Intergingival fibers are stretched in mesio-distal direction along the arch and around the last molar teeth in the arch. These bundles are the link adjacent teeth in the dental arch block (Fig. 2-15). 6. Intercircular fibers to surround a few teeth. These fibers reference of the " group of adjacent teeth in the dental arch units. 7. Interpapillary fibers are papillae coronal (above) transseptal fiber bundles. These fibers groups connections oral and vestibular interdental papillae posterior teeth (Fig. 2-15). 8. Forming fibers come from cement, near the FAC and work horizontally between adjacent teeth (Fig. 2-15). These bundles are the link adjacent teeth in the dental arch units. 9. Transseptal Paz with cement single tooth, over the crest of the alveolar bone, cement adjacent teeth (Fig. 2-15). These bundles of fibers connect adjacent teeth with each other and safe alignment of the teeth in an arch.